Optional: Add a miniature carrot or two for the bunnies to snack on. Look in the bulk food section of the store to buy only the amount you need of raisins or sliced almonds. Place about 1/2 cup shredded lettuce on each plate. Place one pear half on the lettuce, cut side faced down. On the narrower end of each pear, make a rabbit face: Poke two pieces of sliced almonds into the pear to make ears. Arrange two raisins for eyes and one for the nose. 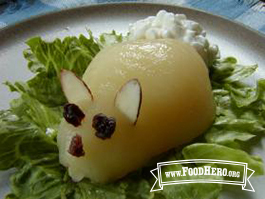 Place 2 Tablespoons of cottage cheese at the opposite end of each pear half to make a tail. 2 Comments for "Hoppin' Pear Salad"
These are so fun! Kids definitely love them! I just made a test run of these for my kids to get ready for Easter. They loved them!